Capsugel’s industry-leading capsule and encapsulation technologies, formulation know-how and customer-focused services provide unique and innovative solutions for biopharmaceutical and consumer health and nutrition companies. 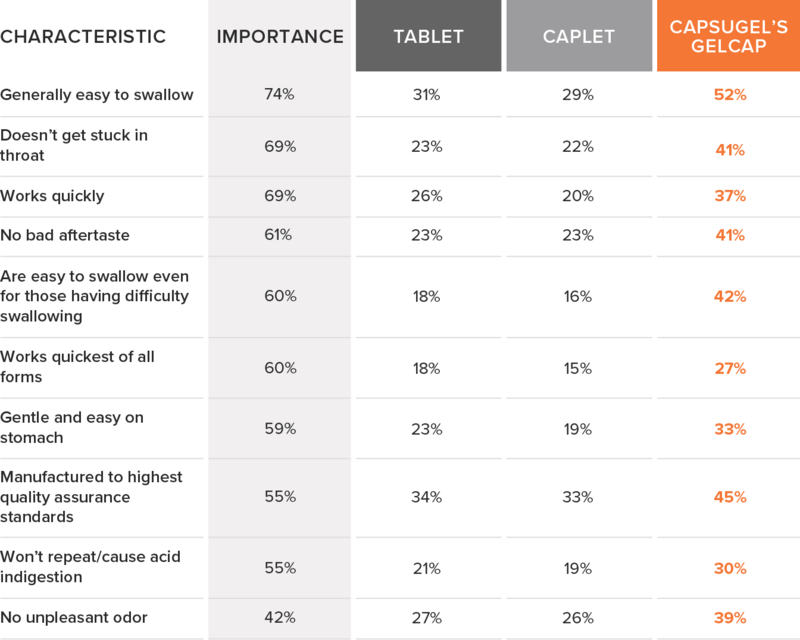 Studies over the last two decades show that consumers continue to increasingly favor gelcoat products over tablets and caplets. In the latest study conducted, 750 consumers in 25 major markets, were surveyed to determine dosage form preference and purchase intent based on various attributes. Consumers overwhelmingly chose gelcoat products. Consumers prefer this attractive product form over tablets and caplets because they are easy to swallow, work quickly and there is no unpleasant odor or aftertaste. *Study of Consumer Preferences: Solid Oral Dosage Forms, U.S Bold numbers are significantly higher than tablets at the 90% level of confidence. As the leading global gelatin capsule manufacturer, Capsugel understands the unique benefits of gelcaps and works closely with clients to help transform their brands based on their unique market dynamics. Gelcaps are created by taking a caplet and enrobing it with two gelatin halves to form an attractive dosage form. Capsugel’s Press-Fit® and XPress-Fit® Gelcap proprietary technology provides an achievable path to market differentiation and brand equity in a highly preferred OTC form. While our traditional Press-Fit gelcaps totally enrobe a caplet core between two high-gloss gelatin coatings, our XPress-Fit technology achieves a faster disintegration time by leaving an exposed center portion of the caplet. This patented technology allows for rapid-release by allowing gastric fluid to enter the exposed center portion and accelerate gelcap disintegration. Studies have shown that consumers worldwide recognize rapid effect as one of the most positive attributes of Capsugel’s XPress-Fit gelcaps which can lead to just as rapid sales growth. Our proprietary enrobing gelcap technology is very difficult to mimic and enables brands to create a new look for their product with minimal effort and without having to reformulate. Our customers turn to Capsugel for this easy-to-apply application as a way to overcome challenges with brand differentiation or for a quick-to-market line extension. Capsugel’s gelcaps can be uniquely configured to fit any branding goals, including single-color unibody design, two-color variations, and transparent halves that show the caplet surface. Logos and printing can also be applied for complete product differentiation. Unlike competing gel-enrobed technologies, Capsugel gelcaps can be easily manufactured in-house without prohibitive investment, or can be outsourced. Capsugel has collaborated with IMA, a leading manufacturer of capsule filling machines, to help you implement a robust process that is easy to install and operate without additional sealing. Capsugel has a proven track record of seamless technical transfer to manufacturing locations globally. NOTE: Some products are not available in Japan. Looking to transform your brand?